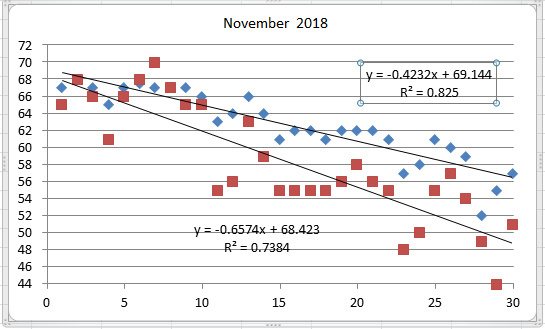 November water temps like October were wildly fluctuating from early to late month. Surf had a high of 68 °, low of 52° a drop of 16° in about three weeks with an average of 62.6°. Sound had a high of 70° and low of 44° an amazing difference of 26°and an average of 58.2°. The difference between high and low for November in the surf and sound was almost the same as October, which in itself was very unusual. Check out the graph, blue diamonds are the surf, red squares are the sound temperatures.